With less than one week left until Guardians of the Galaxy hits theaters nationwide, many fans are already looking ahead to the sequel, Guardians of the Galaxy 2. We reported yesterday that James Gunn will return to write and direct the sequel, and the filmmaker revealed in an interview with FilmDivider that he already has some ideas for the follow-up, but be warned, there may be some spoilers for Guardians of the Galaxy below, so read on at your own risk. In Guardians of the Galaxy, Peter Quill (Chris Pratt) was taken from Earth as a young boy and raised by Yondu (Michael Rooker) and his group of Ravagers. 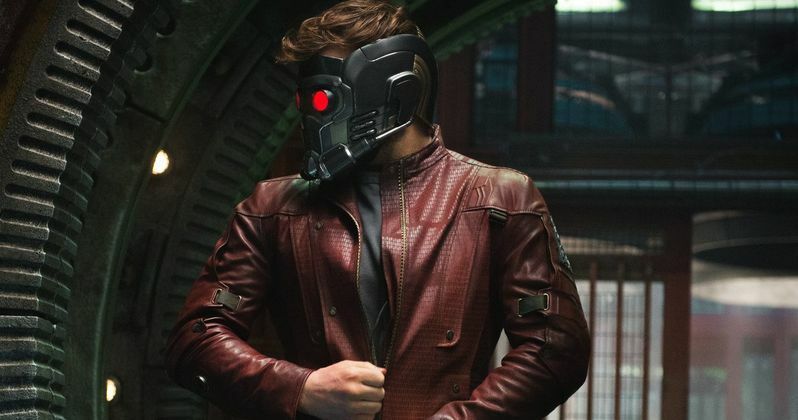 The writer director revealed that he wants the follow-up to include new details about Peter Quill's real father, along with background on Yondu and Drax the Destroyer (Dave Bautista). "I know a lot of where I want to go. I have a lot of ideas for stories and characters that are going to appear, and there are documents written up, that some people have, about Peter Quill's father and his relationship, a lot of stuff about Yondu and a lot of stuff about Drax that nobody knows. There are a lot of things that are part of the overall schematic that already exist, not to mention a lot of stuff about all of the cultures. There's a lot of stuff about Xandarian and Kree culture that I've written down or I have in my head, as well as Krylorians and Ravagers." He also teased that Nebula (Karen Gillan) will also be featured in his follow-up. "Kevin Feige has stuff. I wrote up a lot. He knows all the stuff and if I died tomorrow they could go make a movie. They could write the story of Peter Quill's father and it would all be there. I think Yondu is a very important character, a really important character in this universe, and I think Nebula is really important too and so I think we'll see more of both of those characters." As you may know, Guardians of the Galaxy initially came through Marvel's writer's program, where Nicole Perlman turned in the first draft, before James Gunn was brought in to rewrite the script and direct. James Gunn touched upon some of the differences between his script and Nicole Perlman's for Guardians of the Galaxy. "Really, in Nicole's script everything is pretty different. I mean the story is different, there's no Walkman, the character arcs are different, it's not about the same stuff. But that's how the WGA works. They like first writers an awful lot." Are you excited to see what James Gunn can do with Guardians of the Galaxy 2? Chime in with your thoughts below.